Newspapering runs in our family across multiple generations. The Park City Record was in the hands of my great-grandfather Raddon’s family in the late 1800s. Last year another relative was on the Pulitzer Prize-winning team at the Washington Post. A graphics editor for the Post, John’s team won “for its revelatory initiative in creating and using a national database to illustrate how often and why the police shoot to kill and who the victims are most likely to be.” More details are HERE. This shows how journalism is making a digital transformation. Big-time newsies such as the Washington Post and New York Times are observing that the digital transformation at newspapers is far from over. 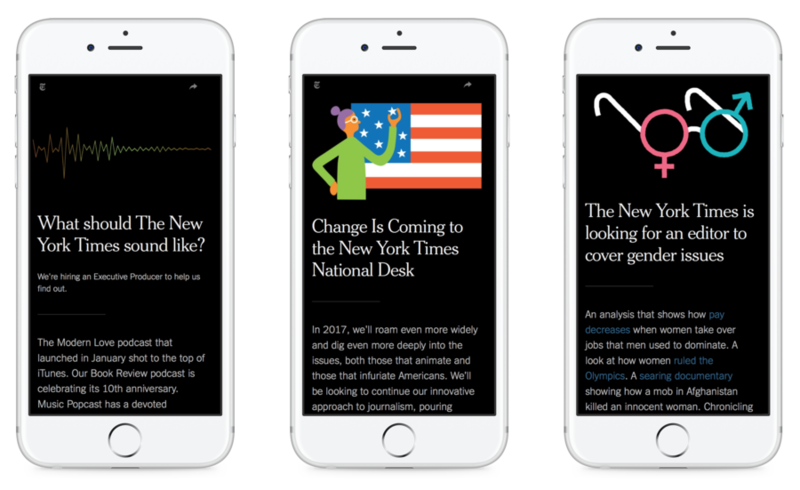 In a report titled “Journalism That Stands Apart,” The New York Times reveals the publisher’s continued efforts to divorce itself from print-centric practices and adapt to an increasingly mobile- and digital-first world. “The report argues that the best way for the Times to improve how it reports the news is to focus on creating content that is unique and impactful to its audience,” as Publishing Executive observes. “In order to differentiate its content, the 2020 Report recommends creating more visual journalism. To accomplish this goal, The Times has rolled out an improvement to its CMS, which will make adding visuals to stories easier for reporters. The Times also plans to train more of its newsroom staff on how to create and embed visuals within their content. Previous Previous post: An Ackerman disciple rejoins The Union as City Editor: Woo-hoo!